Molded of high strength engineering grade polymer. 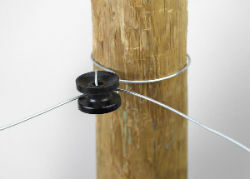 Able to withstand the constant pressure of high tensile fence wire. Use for corners, ends, dips and rises. All weather.